Happy 4th everyone! July 4th is a day to celebrate America. 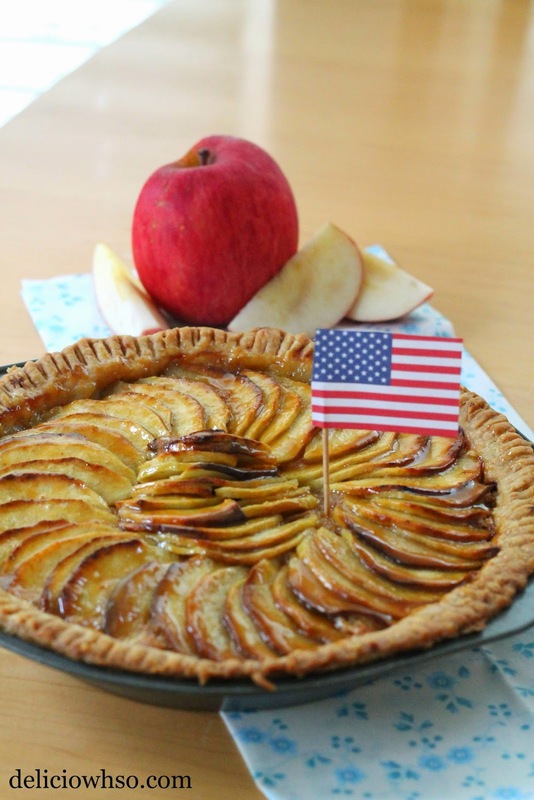 What could be more American than an apple pie? I personally am not a huge fan of pies. I don't like the filling-to-crust ratio of most pies. I'm also not too fond of the mushy cooked fruit that goes inside. I decided to make a pie that's a slight twist on the traditional apple pie made with thinly sliced apples, almond cream, and salted caramel. for a more traditional flavor, you can omit the salt. 1. Place sugar, salt, and water in a clean pot and heat. Stir only until it begins to boil. 2. If needed, brush the sides of the pot with water to wash down any sugar crystals. Do not stir. 3. Heat cream in the microwave for 20 seconds to warm. 4. Allow the caramel to get to a dark golden/amber color. 5. Turn off the heat, add warm cream, and stir. Be careful, because there will be a lot of hot steam! 6. Add butter to caramel and mix to incorporate. 7. Pour into a bowl and allow to cool. 2. Cut each apple in half. Cut at the stem. Cut the top and bottom off of each apple half. 3. Use a melon baller to core the apples. 4. Cut 1/8 inch slices starting from the top of the apple, so that if you look at the apple standing up, the slices are horizontal. 5. Put slices into a bowl with lemon juice. Toss slightly. 6. Mix cinnamon and sugar and sprinkle over the apples. Toss slightly. 2. Lightly grease your pie tin with butter. 3. Roll out your pie dough to about 1/4 inch and place into the tin. 5. Spread the frangipane into an even layer. 6. Place a layer of apples on top of the frangipane layer. Then, place another layer on top, to make a decorative pattern. 7. Cut up butter into small cubes and sprinkle over the top of the apples. 8. Bake for 1 hour 30 minutes, until golden. 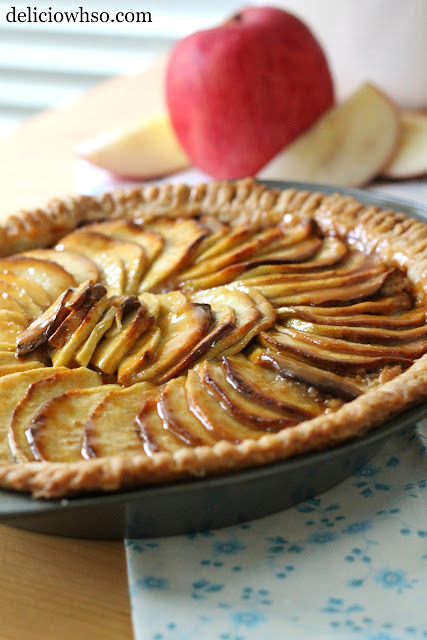 This seems like a long time, but because of the moisture of the apples, the pie bakes very slowly. 9. Reheat caramel sauce in microwave, 20 seconds at a time until it is runny. 10. Brush the hot pie with salted caramel sauce to glaze. Cool slightly and serve warm.